For the song by EXO, see Lightsaber (song). 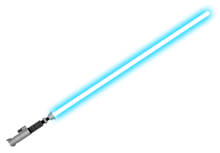 A lightsaber is a fictional energy sword featured in the Star Wars universe. A typical lightsaber is depicted as a luminescent blade of magnetically contained plasma about 3 feet (91 cm) in length emitted from a metal hilt around 10.5 inches (27 cm) in length. The lightsaber is the signature weapon of the Jedi Order and their Sith counterparts, both of whom can use them for melee combat, or to deflect blaster bolts. Its distinct appearance was created using rotoscoping for the original films, and with digital effects for the prequel and sequel trilogies. The lightsaber first appeared in the original 1977 film A New Hope and has since appeared in every Star Wars movie, with at least one lightsaber duel occurring in each main film installments. In 2008, a survey of approximately 2,000 film fans found it to be the most popular weapon in film history. In its most prominent showing, the lightsaber's energy blade can cut, burn, and melt through most substances with little resistance. It leaves cauterized wounds in flesh, but can be deflected by another lightsaber blade, or by energy shields. The blade has even been used as a tool to weld metal substances. Other times, the lightsaber has been shown to cause bleeding wounds in the flesh, sometimes accompanied by burns. Some exotic saber-proof materials have been introduced in the Expanded Universe. An active lightsaber gives off a distinctive hum, which rises in pitch and volume as the blade is moved rapidly through the air. Bringing the blade into contact with another lightsaber's blade produces a loud crackle. Gordon R. Dickson's "rod" from Wolfling showing the similarity it bears to a lightsaber. Edmond Hamilton's story Kaldar: World of Antares (published 1933 in the April issue of The Magic Carpet Magazine). It was reprinted in one of Donald A. Wollheim's well-known and widely read science fiction anthologies, Swordsmen in the Sky, Ace Books 79276, 1964, and thus readily available to the science fiction reader community of the 1960s and 1970s. Fritz Leiber's Gather Darkness (1943): the priests' "rods of wrath" (energy projections) only end where they cut into solid matter, so that a single duel led to numerous casualties of bystanders and charred scores across all nearby walls. Isaac Asimov's Lucky Starr series (1952): The force-blade is "a short shaft of stainless steel" which can project a force field that can cut through anything, making it "the most vicious weapon in the galaxy." Asimov's force-blade expands on his earlier invention of "a penknife with a force-field blade," first used in his Foundation novel (1951). Gordon R. Dickson's Wolfling (1969): the rod “… something in appearance like a cross between the flame of a welding torch and the arc of a static electricity charge crackled from the end of the rod … even as it burst from the end of the rod … the discharge from Galyan's rod met the discharge from Slothiel's head on, and the two lines of white fire splashed harmlessly into an aurora of sparks, …". In a 1977 interview, Lucas stated "As a kid, I read a lot of science fiction,…I was interested in Harry Harrison…” and this issue of Analog ends a Harry Harrison story on the back of the page with a drawing of this duel. Larry Niven's Ringworld (1970): Louis Wu uses his "flashlight laser" as a sword of indefinite length. Ringworld also features a "variable sword", consisting of a handle containing a spool of invisibly thin, molecule-thick wire. In use the wire is unspooled to the desired length and made rigid by a "stasis field". Some depictions show the field glowing. M. John Harrison's The Pastel City (1971): the energy baan are used by the Methven, an order of knights sworn to protect their empire. Covered with millions of tiny glass beads, [Scotchlite] has the property of reflecting light directly back to its source. It's the same material used for reflective road signs [and lightsaber props]. For the original Star Wars film, the film prop hilts were constructed by John Stears from old Graflex press camera flash battery packs and other pieces of hardware. The full sized sword props were designed to appear ignited onscreen, by later creating an "in-camera" glowing effect in post-production. The blade is a three-sided rod which was coated with a Scotchlite retroreflector array, the same sort used for highway signs. A lamp was positioned to the side of the taking camera and reflected towards the subject through 45-degree angled glass so that the sword would appear to glow from the camera's point of view. Set decorator Roger Christian found the handles for the Graflex Flash Gun in a photography shop in Great Marlborough Street, in London's West End. He then added cabinet T-track to the handles, securely attaching them with cyanoacrylate glue. Adding a few "greebles" (surface details), Christian managed to hand-make the first prototype of a lightsaber prop for Luke before production began. George Lucas decided he wanted to add a clip to the handle, so that Luke could hang it on his belt. Once Lucas felt the handle was up to his standards, it went to John Stears to create the wooden dowel rod with front-projection paint so that the animators would have a glow of light to enhance later on in post production. Due to lack of preparation time, Christian's prototype and a second spare were used for the shooting in Tunisia, where Star Wars filming began. It was discovered, however, that the glowing effect was greatly dependent on the rod's orientation to the camera, and during the Obi-Wan Kenobi/Darth Vader duel, they could clearly be seen as rods. Because of this, the glow would be added in post-production through rotoscoping, which also allowed for diffusion to be employed to enhance the glow. Korean animator Nelson Shin, who was working for an American company at the time, was asked by his manager if he could animate the lightsaber in the live action scenes of a film. After Shin accepted the assignment, the live action footage was given to him. He drew the lightsabers with a rotoscope, an animation which was superimposed onto the footage of the physical lightsaber blade prop. Shin explained to the people from Lucasfilm that since a lightsaber is made of light, the sword should look "a little shaky" like a fluorescent tube. He suggested inserting one frame that was much lighter than the others while printing the film on an optical printer, making the light seem to vibrate. Shin also recommended adding a degausser sound on top of the other sounds for the weapon since the sound would be reminiscent of a magnetic field. The whole process took one week, surprising his company. Lucasfilm showed Shin the finished product, having followed his suggestions to use an X-Acto knife to give the lightsaber a very sharp look, and to have sound accompany the weapon's movements. The lightsaber sound effect was developed by sound designer Ben Burtt as a combination of the hum of idling interlock motors in aged movie projectors and interference caused by a television set on a shieldless microphone. Burtt discovered the latter accidentally as he was looking for a buzzing, sparking sound to add to the projector-motor hum. The pitch changes of lightsaber movement were produced by playing the basic lightsaber tone on a loudspeaker and recording it on a moving microphone, generating Doppler shift to mimic a moving sound source. Lightsabers were present in the earliest drafts as mundane laser weapons that were used alongside laser guns. The introduction of the Force in a later revision made the Jedi and the Sith supernaturally skilled; initially they were only portrayed as swordsmen. The lightsaber became the Force-user's tool, described in A New Hope by Obi-Wan Kenobi as "not as clumsy or random as a blaster. An elegant weapon, for a more civilized age." The source of a lightsaber's power is a kyber crystal. These crystals are also the power source of the Death Star's superlaser. Lightsabers are depicted as hand-built as part of a Jedi's or Sith's training regimen. Each lightsaber is unique, though some may bear resemblance to others, especially if there is a connection between the builders. The first film appearance of the dual-bladed lightsaber (introduced in Tales of the Jedi) was in The Phantom Menace, wielded by Darth Maul. The video game The Force Unleashed introduced two other variants: a lightsaber pike (a lightsaber with a shorter blade but a long handle, resembling a spear) and a Tonfa-style lightsaber with right-angle hilt. 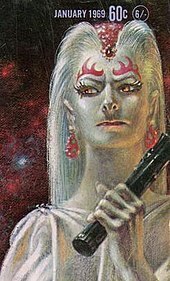 The Star Wars expanded universe adds several lightsaber types, including short and dual-phase (adjustable length) weapons. In Star Wars Rebels, Ezra Bridger's original lightsaber is a hybrid that features a fully functional blaster pistol built into the handle. Kylo Ren, from The Force Awakens, uses a lightsaber that features two crosshilt blades, giving it the appearance of a greatsword. Lightsabers depicted in the first two released films, A New Hope and The Empire Strikes Back, had blades that were colored either blue (for the Jedi) or red (for the Sith). Luke Skywalker's new lightsaber in Return of the Jedi was colored blue during the initial editing of the film, and appears so in both an early movie trailer and the official theatrical posters, but it was ultimately colored green in the film. This was done so it would better stand out against the blue sky of Tatooine in outdoor scenes, and this color change is also reflected in the film's re-release posters. Mace Windu's purple-bladed lightsaber, as first seen in Attack of the Clones, was requested by the actor Samuel L. Jackson as a way to make his character stand out among other Jedi. Jackson's favorite color is purple, and he frequently requests that the characters he plays use an item of that color. The Clone Wars showed the guardians of the Jedi Temple wielding yellow-bladed lightsabers, and introduced the "Darksaber", which uniquely features a thin white outline around a black blade. In the storyline, the builder of a lightsaber chooses the kyber crystal within it, which in turn determines the blade's color. The book Star Wars: Ahsoka and the comic series Darth Vader: Dark Lord of the Sith reveal red blades to be an exception; to create a red blade, dark side users remove the crystal from a defeated Jedi's lightsaber and concentrate force energy on it to break its connection to the light side, a process known as "bleeding". The process can also be reversed, as shown in Ahsoka when the titular character does so to a pair of crystals taken from an Inquisitor; she uses them in a pair of white-bladed lightsabers. A multitude of visible spectrum blade colors appeared in the Expanded Universe and in other Star Wars products. The original Kenner figure of Luke Skywalker in his Tatooine costume from Star Wars was released with a yellow-bladed lightsaber. 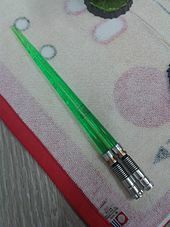 While no lightsaber blade colors beside blue, green or red appeared in the films before Attack of the Clones, they have appeared in several computer games, which sometimes allow for player-customized colors. The Knights of the Old Republic video game series included yellow and silver options, for example. The technical lightsaber choreography for the original Star Wars trilogy was developed by Hollywood sword-master Bob Anderson. Anderson personally trained Mark Hamill (Luke Skywalker) and, in The Empire Strikes Back and Return of the Jedi, performed all the stunts as Darth Vader during the lightsaber duels wearing Vader's costume. Anderson's role in the trilogy was highlighted in the film Reclaiming the Blade where he shared his experiences as a fencer developing the lightsaber techniques for the three original movies. The lightsaber duels in the Star Wars prequel trilogy were specifically choreographed by stunt-coordinator Nick Gillard to be miniature "stories". For these films, Gillard was the primary sword instructor for Liam Neeson (Qui-Gon Jinn), Ewan McGregor (Obi-Wan Kenobi), Ray Park (Darth Maul) and Hayden Christensen (Anakin Skywalker / Darth Vader) among other actors. His goal in choreographing the action for The Phantom Menace was to create stunts that flow from the story; "You can't just think, 'I'm a stunt coordinator, I'm going to make a big stunt happen'," Gillard said. "It's all about making it tie in nicely with the film so that you don't notice the stunts." In writing the prequel trilogy, George Lucas said he wanted the lightsaber combat to be "reminiscent of what had been done in the previous films but also something that was more energized. We'd seen old men, young boys, and characters who were half-droid, but we'd never seen a Jedi in his prime. I wanted to do that with a fight that was faster and more dynamic – and we were able to pull that off." According to Gillard (who would later go on to perform a cameo role in Revenge of the Sith), various lightsaber combat styles were devised for the prequels and intended to further characterize their practitioners. I developed different styles for the characters, and gave each of them a flaw or a bonus. So with Obi-Wan Kenobi, for instance, he's got a very business-like style – when he was younger he could border on the flashy and might twirl his lightsaber a bit, because he was taught by Qui-Gon. Qui-Gon was brash, that rubbed off on Obi-Wan and Obi-Wan then taught Anakin, who was way too old to learn anyway... I think the style really worked well. The Jedi style of fighting is an amalgamation of all the great swordfighting styles. Melding them together is the difficult part – to move from a Kendo style to, say, rapier requires a complete change in body and feet movement, and this must look effortless. The style moves seamlessly between the different disciplines, but remains technically correct throughout. For The Phantom Menace, Gillard set out certain styles and faults for the saber-wielding characters. He added that the Jedi's use of such "a short-range weapon" meant "they would have to be very good at it"; combining a variety of disciplines from various sword fighting styles to martial arts "with a touch of tennis and tree chopping", he created the style seen in the Episode I lightsaber battles. For The Force Awakens, director J. J. Abrams decided to approach the choreography similarly to how it was done in the original trilogy. Abrams stated that the prequel trilogy choreography was "increasingly spectacular and stylised, almost like dance choreography", but that was not what they really wanted to go for the new films. He told Empire magazine, "When you look at Star Wars and Empire, they are very different lightsaber battles, but for me they felt more powerful because they were not quite as slick. I was hoping to go for something much more primitive, aggressive and rougher, a throwback to the kind of heart-stopping lightsaber fights I remembered being so enthralled by as a kid." Since the release of the first film, replicas of lightsabers have been a popular piece of Star Wars merchandise, ranging from inexpensive plastic toys to the "Force FX" series from Master Replicas, deluxe replicas which use LED lighted tubes and sound effects to create a close audio-visual representation of what is seen on screen. Disneyland in California sells lightsaber-themed churros outside its Star Tours attraction. The Jedi Training: Trials of the Temple is a live show where children are selected to learn the teachings of the Jedi Knights, the Force, and the basics of Lightsaber combat to become Padawan learners. The show is present at the Rebels stage at Disney's Hollywood Studios and at the Tomorrowland Terrace at Disneyland. In the Spaceballs film by Mel Brooks, "the Schwartz" is a play on "the Force", from Star Wars. The lightsabers emanating from the Schwartz-rings held in front of the crotch are phallic symbols. The cartoon series Futurama features many lightsaber-style weapons, notably expanding batons used by police. The batons glow and "whoosh" with a lightsaber's distinctive hum, but merely slap victims when used, as if they are plastic toys. In Jim Butcher's Dresden Files novel series, medical examiner and Star Wars fan Waldo Butters wields one of the three holy Swords of the Cross, which re-fashions itself into a lightsaber upon accepting him as its owner. With the advent of motion-controlled video games, the opportunity to physically wield a lightsaber in a video game became a reality. In the seventh generation of video game consoles, there were several Star Wars video games available on the Wii (Lego Star Wars: The Complete Saga, Star Wars: The Force Unleashed, Star Wars: The Clone Wars - Lightsaber Duels, Star Wars: The Clone Wars - Republic Heroes and Lego Star Wars III: The Clone Wars) and one on the Xbox 360 (Kinect Star Wars) that utilized motion controls to wield a lightsaber through arm gestures. Unleashed and Duels, both developed by Krome Studios, have more precise control of the lightsaber, allowing players to swing it in any of five different directions (up, down, left, right or forward) with the Wii Remote, while Kinect takes advantage of the eponymous, camera-based motion controller to grant the player a more fluid, one-to-one control method of swinging the lightsaber. Prior to the seventh generation, there were also a few earlier Star Wars games that used gesture-based control to simulate lightsaber combat, such as the two bonus levels of the arcade game Star Wars Trilogy, where the player controls Luke Skywalker as he wields his lightsaber against Boba Fett and Darth Vader in Return of the Jedi by pushing a joystick in one of eight directions to follow on-screen offensive and defensive cues, and a TV game released around the release of Revenge of the Sith, titled Star Wars: Saga Edition - Lightsaber Battle Game, in which the player swings a lightsaber-shaped controller to deflect blaster bolts from infantry (such as battle droids and clone troopers) and duel against characters from across the saga. By the time Disney purchased Lucasfilm, new technological advances made augmented reality possible, leading to the creation of some more notable motion-controlled lightsaber video games that took advantage of that feature. One of them came in the form of a special activity mode in the official Star Wars fan app on iOS and Android in which players use their smartphone's motion sensors to practice and master blaster deflection with a training droid (which appears on the phone's rear camera), similar to the deflection training exercises featured aboard the Millennium Falcon in A New Hope, while progressing through the ranks of the Jedi or Sith order. Another is in Star Wars: Jedi Challenges, which works with a Lenovo Mirage AR headset, a tracking sensor and a dedicated lightsaber controller that launched in December 2017. One of the multiple game modes available in Challenges, which was jointly developed by Disney and Lenovo, enables players to confront Star Wars villains in lightsaber duels, such as Darth Maul and Kylo Ren. ^ "Star Wars A New Hope prop light sabre". December 21, 1994. Archived from the original on August 27, 2012. Retrieved July 31, 2018 – via proparchives.com. ^ Sophie Borland (January 21, 2008). "Lightsabre wins the battle of movie weapons". The Daily Telegraph. Retrieved 2008-01-26. ^ The Game Theorists (31 January 2016). "Game Theory: Star Wars Lightsaber Vs Halo Energy Sword" – via YouTube. ^ Campbell, John W., ed. (January 1969). "Wolfling". Analog Science Fiction and Fact. New York City: Conde Nast Publications. 82 (6). ^ Eight Miles Higher: Book Review: Edmond Hamilton 'City At World's End'. Andrewdarlington.blogspot.co.il (March 30, 2012). Retrieved on 2013-07-28. ^ "Rod of Wrath by Fritz Leiber from Gather Darkness". technovelgy.com. Archived from the original on 10 February 2017. Retrieved 22 December 2016. ^ "Star Wars Origins - Lightsabers". ^ a b Dickson, Gordon R. (March 1969). Campbell, John W. (ed.). "Wolfling". Analog Science Fiction and Fact. New York City: Conde Nast Publications. 82 (8): 118–162. ^ Zit0, Stephen (April 1977). "George Lucas Goes Far Out". American Film. The American Film Institute. 2 (6): 8–13. ^ Harrison, Harry (March 1969). Campbell, John W. (ed.). "From Fanaticism, of For Reward". Analog Science Fiction and Fact. New York City: Conde Nast Publications. 82 (8): 108–117. ^ a b TV Tropes: Laser Blade, see "Literature". ^ TV Tropes: Variable Sword, see "Literature". ^ a b Miller, Ron (2006). Special Effects: An Introduction to Movie Magic. Minneapolis: Twenty-first Century Books. p. 89. ISBN 9780761329183. OCLC 60419490. ...a material called Scotchlite. Covered with millions of tiny glass beads, it has the property of reflecting light directly back to its source. It's the same material used for reflective road signs (and the glowing light sabers in Star Wars, which were sticks wrapped in Scotchlite). ^ "How the lightsaber was born" (video interview). BBC. 15 December 2017. Retrieved 20 December 2017. ^ "Interview with Nelson Shin". CNN. November 9, 2007. ^ Burtt, Benn (1993), Star Wars Trilogy: The Definitive Collection, Lucasfilm, ...the microphone passed right behind the picture tube and as it did, this particular microphone produced an unusual hum. It picked up a transmission from the television set and a signal was induced into its sound reproducing mechanism, and that was a great buzz, actually. So I took that buzz and recorded it with the projector motor sound and that fifty-fifty kind of combination of those two sounds became the basic Lightsaber tone." ^ "Why We Still Love Star Wars: Lightsaber 101". Parade magazine. December 3, 2017. p. 9. The lightsaber wooshing sounds are created by waving a microphone in front of a speaker playing humming and buzzing noises. ^ Lucas, George (May 1973), The Star Wars, story synopsis, An alarm sounds. The rebels are forced to fight their way out of the prison with "multiple lazer guns" and swords. ^ Lucas, George (May 1974), The Star Wars, rough draft, Ten troopers break out of the ranks and take up the chase. Starkiller runs down a corridor and rounds a corner, reaching a dead end. The troops round the corner and confront the trapped Jedi. ^ Bricken, Rob. "13 Things You Probably Don't Know About Lightsabers". gizmodo.com. Retrieved 22 December 2016. ^ Eisenberg, Eric. "What Are Kyber Crystals, And Why Are They Important To Star Wars?". CinemaBlend. Retrieved December 26, 2016. ^ "Death Star Superlaser". StarWars.com. ^ BioWare (November 19, 2003). Star Wars: Knights of the Old Republic. PC. LucasArts. ^ Anderson, Kevin J. (1994). Dark Apprentice. The Jedi Academy Trilogy. Bantam Spectra. ^ Foster, Alan Dean (1979). Splinter of the Mind's Eye. Ballantine Books. ^ BBC (June 28, 2013). "Samuel L. Jackson's Purple Light Sabre - The Graham Norton Show: Series 13 Episode 13". BBC One. Retrieved May 10, 2018 – via YouTube. ^ "Creating the Lightsaber Battles in ROTS Game". TheForce.Net. May 4, 2005. Archived from the original on July 24, 2011. Retrieved 2010-09-30. ^ "March-Interview with stunt co-ordinator Nick Gillard (Mr. Optimism)". Retrieved 2009-06-21. ^ "Nick Gillard Talks ROTS Game". TheForce.Net. May 8, 2005. Archived from the original on December 7, 2008. Retrieved 2008-11-28. ^ Episode I Video: Prime of the Jedi Archived 2008-07-01 at the Wayback Machine -(part of the "Making Episode I" series). ^ a b Hide, Viral. "New Revelations From Empire's New Issue on The Force Awakens". starwarsnewsnet.com. Retrieved 22 December 2016. ^ Messina, Victoria (May 9, 2017). "Disneyland Now Has Sparkly Lightsaber Churros, and We Need Them ASAP". PopSugar. Retrieved May 11, 2017. ^ David Margolick, "LAW: AT THE BAR; More lawyers are less happy at their work, a survey finds", New York Times, August 17, 1990. ^ David A. Kaplan, "Requiem for a law firm", Newsweek, January 7, 1991. ^ Emily Bryson York, "Writers' rights: L.A. attorney Alan Schwartz has represented Truman Capote and Mel Brooks", Los Angeles Business Journal, August 14, 2006. ^ Kharpal, Arjun (August 31, 2017). "Lenovo, Disney launch Star Wars Jedi aurgmented reality game that lets you use a real lightsaber". CNBC. Retrieved October 23, 2017. Wikimedia Commons has media related to Lightsabers. "Howstuffworks – Inside the Lightsaber"